We see our faces in the mirror every day, so we tend to focus our anti-aging efforts on them while forgetting that our bodies are the same age. 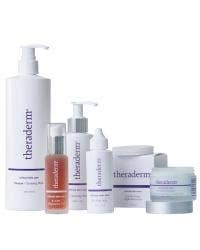 Using Theraderm products on places other than your face will make for healthier, younger looking skin all over. This month, keep your focus on your entire body and learn to love the skin you’re in. Your favorite Theraderm products aren’t just for your face. By using our Skin Renewal System and other customer favorites all over your body, you’ll enjoy healthy, beautiful skin from head to toe. Cleansing Wash is an ideal cleanser for skin and is great for washing your hands, body and hair. Fruit Acid Exfoliant can be used after shaving to prevent ingrown hairs. It also prevents symptoms such as pain, blistering and redness when applied to a burn. All of the facial moisturizers can be used on the entire body to hydrate normal skin, while the Body Restoration Crème and Extreme Dry Skin Therapy are effective for moisturizing dry, damaged skin. NuPeel Natural Enzyme Peel can be used on your body to create a smooth, even surface for enhanced benefits of moisturizers and lotions. This product is also effective when used after shaving to prevent flaking. Having healthy, beautiful skin doesn’t stop with your face. It’s just as important to keep the skin on your hands, feet, legs and arms smooth, soft and damage-free. Instead of hiding cracked heels, age spots and flaky skin, treat those issues with Theraderm and show off your beautiful skin.